A pilot test has been performed in the NE of Italy to detect and monitor the sub-surface behaviour of a salt-water solution within a sand-gravel aquifer. 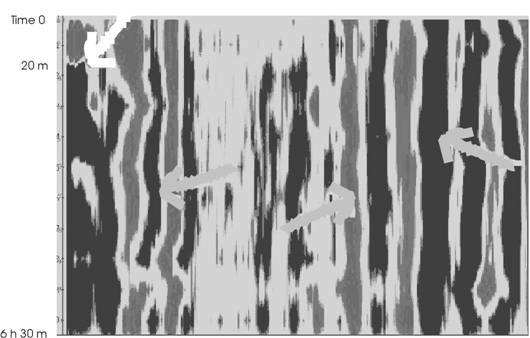 Two geophysical, non-destructive techniques have been used and combined: multi-electrode tomography and Ground Penetrating Radar profiling. The experiment consisted in pumping two cubic meter of salt-water solution – which presents a high conductibility value - into a well, in order to detect variations of resistivity vs. time during the flow of the solution within the aquifer. Geophysical data have been repeatedly acquired to measure the flow velocity within the aquifer, on the basis of occurrence of resistivity changes. The experiment has required a specific geometry for the geo-electric acquisition, taking into account the target depth (from 4 to 20 m), short acquisition time, high-resolution tomography. The experiment has proven its potentiality in identifying the presence of the contaminating solution and monitor its diffusion flux within the aquifer. This experiment is carried on in collaboration with the Dipartimento di Scienze Ambientali, Geologiche e Marine of the University of Trieste. The university staff is studying the behaviour of an aquifer using several methods. This is an opportunity to test the efficacy of GPR and ERT in detection the water movement. Using the injection of a salt solution in the well n. 1 it is possible to define with a time-lapse survey the feature of this movement. The results are really interesting because they are useful in pollution case too. The site test is located in the Osoppo plane, a particular environment in the North of the Friuli Venezia Giulia region in Italy. The area is characterized by a stratigraphy with permeable sedimentary deposits having sometimes inside lens of cemented gravel; it is near a water flow and the water table is close to the surface. By a morphological point of view the meadow is a first order terrace of the Tagliamento river. Two embankments 2 m high are present, one delimits the northern part of the area, the other delimits the SW-part. The mainly direction of water flow is N-S and bibliography data of water velocity indicates it between 1.5 and 2.3 m/h. The target of the survey is the detection of the resistivity anomaly due to the injection of salt water solution in the subsurface. Two lines of 32 electrodes having 5 m electrodes spacing are placed on field. The multielectrode data is collected by the use of a resistivimeter Syscal R2 and a Multinode system by Iris Instruments. The two lines named OS-e01-02 and OS-e02-02 are nearly perpendicular: The line OS-e01-02 has a N-S direction and intersect the well n. 1 between the electrodes 9 and 10. This line has the same direction of the water flow and it is used for the time lapse survey for the monitoring of the salt solution. The other line is far 45 m S from the well n. 1 and has a E-W direction. Its function is the possibility to detect lateral water movements. The acquisition geometry used is Wenner-Schlumberger. All the data are inverted using the RES2DINV software. The resistivity models of the two lines acquired before the injection of salt solution give a lot of information on the subsurface. In both lines it is possible to characterize the high resistivity structure of the banks while it is evidenced as the superficial part of the inner zone to the banks is characterized from the presence of a superficial low resistivity level due to the presence of sand deposits. Such level is approximately 5 m of thickness, after there is a resistivity increase because of the presence of an horizon, thick approximately 10 m of “clean” gravels, water saturated, to whose inside is noticed some lens of cemented gravel having high resistivity values. The depth increase create low resistivity values because of gravel with fractions of finer sediments, water saturated. This description is in agree with the drill data. The injection of salt water occurs at a depth between 10 and 20 m, because of this it was necessary to optimise the multielectrode acquisition. A good compromise between fast data acquisition and model detail is required. Of course a complete sequence of acquisition isn’t useful, because it would take so much long time. A new sequence is created: with 182 quadripoles is possible to investigate a depth between 10 and 20 m in about 15 minutes. This sequence is used for the time-lapse survey and the monitoring of the water movement. After a first measurements without salt, at 09.11 start the solution injection. Analysing the resistivity models acquired at different times in the same day, is possible to define the resistivity variation due to the presence of the salt solution. In this part of subsurface the calculation of the horizontal velocity is possible. At different depths the resistivity lines shift is observed. The maximum velocity is at a depth of 12 m from the surface (depth 168 m) where a velocity of 1.44/m/h is measured, the minimum velocity is 0.39 m/h at depth 165 m, the deeper velocity calculation made. The calculate average velocity is of 0.84 m/h. We created a diagram obtained by observing the shift of a fixed resistivity line at different depth. It is possible to see the different phases of salt injection and the same trend at different depth. If we see the effect of the salt solution in the whole model, the time gap between the upper an the lower resistivity model is of 8 hours. Many important difference are present near the well. The sal 11-4 model has lower resistivity values in the well area comparing to the sal 11-0 model. But the presence of cemented gravel may be an obstacle to the water movement, in fact at 20 m far from the well no changes are observable in the two models. The transmission of electromagnetic waves into the ground depends on the electric media properties: dielectric constant and conductivity. The first parameter is related to phase velocity and the second to attenuation. The salt injection increases the conductivity of subsoil and blocks the penetration of electromagnetic wave. In this soil the electromagnetic wave has a good penetration, in several areas we have signal until 250 ns (ca. 8-10 meters). In all profile there was a lot of environmental noise (high frequency) and lateral waves from surface objects. The sections B,C,D,E,H,I,L;M,N,O and P don’t show differences during monitoring (6 hours and half). The most important amplitude and phase alteration of signals are next well. For following these changes, with all A profiles we can build a cube. The dimensions of cube are x=length of profile, y=time from injection and z=time of trace. Then we can see the single timeslice at several depth. Close the well after 20 minutes from injection at 130 ns it’s possible to see a change of phase. Another interesting section is G. In the profiles acquired 5h40m after salt injection the amplitude of reflectors is low and we have an increment of high frequency noise. This situation could be caused by an increment of conductivity. This experiment demonstrates that it possible to detect and monitor the sub-surface behaviour of a salt-water solution within a sand-gravel aquifer with geophysical non-destructive techniques. The use of two integrated electromagnetic methods (multi-electrode tomography and Ground Penetrating Radar) aids in identifying the presence of the contaminating solution within the aquifer, because the comparison of the two information allows a more complete interpretation of the same electrical property (conductivity). The figure illustrates a time slice at 130 ns. White arrow shows phase change, while grey arrows the unchanged reflections. The length of profiles is 40 m.